Presynaptic homeostatic plasticity stabilizes information transfer at synaptic connections in organisms ranging from insect to human. By analogy with principles of engineering and control theory, the molecular implementation of PHP is thought to require postsynaptic signaling modules that encode homeostatic sensors, a set point, and a controller that regulates transsynaptic negative feedback. The molecular basis for these postsynaptic, homeostatic signaling elements remains unknown. Here, an electrophysiology-based screen of the Drosophila kinome and phosphatome defines a postsynaptic signaling platform that includes a required function for PI3K-cII, PI3K-cIII and the small GTPase Rab11 during the rapid and sustained expression of PHP. We present evidence that PI3K-cII localizes to Golgi-derived, clathrin-positive vesicles and is necessary to generate an endosomal pool of PI(3)P that recruits Rab11 to recycling endosomal membranes. A morphologically distinct subdivision of this platform concentrates postsynaptically where we propose it functions as a homeostatic controller for retrograde, trans-synaptic signaling. Homeostatic signaling systems stabilize the functional properties of individual neurons and neural circuits through life (Marder and Prinz, 2002; Turrigiano et al., 1998; Burrone et al., 2002; Davis, 2006, 2013). Despite widespread documentation of neuronal homeostatic signaling, many fundamental questions remain unanswered. For example, given the potent action of homeostatic signaling systems, how can neural circuitry be modified during neural development, learning, and memory? Although seemingly contradictory, the homeostatic signaling systems that stabilize neural function throughout life may actually enable learning-related plasticity by creating a stable, predictable background upon which learning-related plasticity is layered (Davis, 2013; Keck et al., 2017). Therefore, defining the underlying molecular mechanisms of homeostatic plasticity may not only inform us about the mechanisms of neurological disease, these advances may inform us regarding how complex neural circuitry is able to accomplish an incredible diversity of behaviorally relevant tasks and, yet, retain the capacity for life-long, learning-related plasticity. Neuronal homeostatic plasticity encompasses a range of compensatory signaling that can be sub-categorized based upon the cellular processes that are controlled including ion channel gene expression, neuronal firing rate, postsynaptic neurotransmitter receptor abundance and presynaptic vesicle release (Anggono et al., 2011; Burrone et al., 2002; Davis, 2006, 2013; Haedo and Golowasch, 2006; Maffei and Fontanini, 2009; Marder and Prinz, 2002; Parrish et al., 2014; Stellwagen and Malenka, 2006; Turrigiano et al., 1998; Watt and Desai, 2010; Zhang et al., 2003). Presynaptic homeostatic potentiation (PHP) is an evolutionarily conserved form of neuronal homeostatic control that is expressed at the insect, rodent and human neuromuscular junctions (NMJ) (Cull-Candy et al., 1980; Davis and Müller, 2015; Frank et al., 2006; Plomp et al., 1995) and has been documented at mammalian central synapses (Burrone et al., 2002; Kim and Ryan, 2010; Liu and Tsien, 1995). PHP is initiated by the pharmacological inhibition of postsynaptic neurotransmitter receptors. The homeostatic enhancement of presynaptic vesicle release can be detected in a time frame of seconds to minutes, at both the insect and mouse NMJ (Frank et al., 2006; Wang et al., 2016). This implies the existence of postsynaptic signaling systems that can rapidly detect the disruption of neurotransmitter receptor function and convert this into retrograde, trans-synaptic signals that accurately adjust presynaptic neurotransmitter release (Figure 1A; see also for review Davis, 2006, 2013; Müller et al., 2015). Notably, the rapid induction of PHP is transcription and translation independent (Goold and Davis, 2007), calcium-independent (Frank et al., 2009), and does not include a change in nerve terminal growth or active zone number (Frank et al., 2006, 2009; Harris et al., 2015; Younger et al., 2013; Wang et al., 2016). Screen of Drosophila kinome and phosphatome in presynaptic homeostatic plasticity. (A) Schematic highlighting the trans-synaptic nature of presynaptic homeostatic plasticity. The 'synaptic set point’ is operationally defined as the combined action of all pre- and postsynaptic parameters that reliably specify the transfer of information at the synapse. The synaptic set point is stably maintained by a trans-synaptic, homeostatic signaling circuit (red arrow) that includes postsynaptic sensors, retrograde feedback signaling, and presynaptic effectors that drive changes in presynaptic vesicle release. At right, the forward genetic screen of the Drosophila kinome and phosphatome is outlined. (B–C) Each point represents average data from a single NMJ. Purple points are in the presence of PhTX. Black points are in the absence of PhTX (baseline). The black hash marks on X and Y axes designate average mEPSP and EPSP amplitudes, respectively, without PhTX. The purple hash marks are averages in the presence of PhTX. The black line in (C) is a power curve fit, equation indicated on graph. The dotted blue lines encompass 95% of all wild-type data points. Recordings made at 0.35 mM [Ca2+]e. (D–E) Screen data of kinase and phosphatase UAS-RNAi driven by muscle and neuron GAL4 plotted as in (B–C) except that each point represent genotypic averages, yellow points (+PhTX) and black circles (-PhTX, baseline). The black line in (D) denotes two standard deviations below the population mean EPSP amplitude of control genotypes from (B). In (D) and (E) the red dot represents GAL4, UAS-RNAi for Pi3K68D.The black line in (E) is the same curve fit to the control data set in C, layered onto the experimental screen data for comparison. Blue dotted lines as in (C). Recordings made at 0.35 mM [Ca2+]e.
There has been considerable progress identifying presynaptic effector molecules responsible for the expression of PHP (Dickman and Davis, 2009; Frank et al., 2009; Harris et al., 2015; Müller and Davis, 2012; Müller et al., 2015; Wang et al., 2016). There has also been progress identifying postsynaptic signaling molecules that control synaptic growth at the Drosophila NMJ (Ballard et al., 2014; Chen et al., 2012; DiAntonio et al., 2001; Harris et al., 2016; McCabe et al., 2004) as well as the long-term, translation-dependent maintenance of PHP (Goold and Davis, 2007; Kauwe et al., 2016; McCabe et al., 2004; Penney et al., 2012, 2016). However, to date, nothing is known about the postsynaptic signaling systems that initiate and control the rapid induction and expression of PHP. 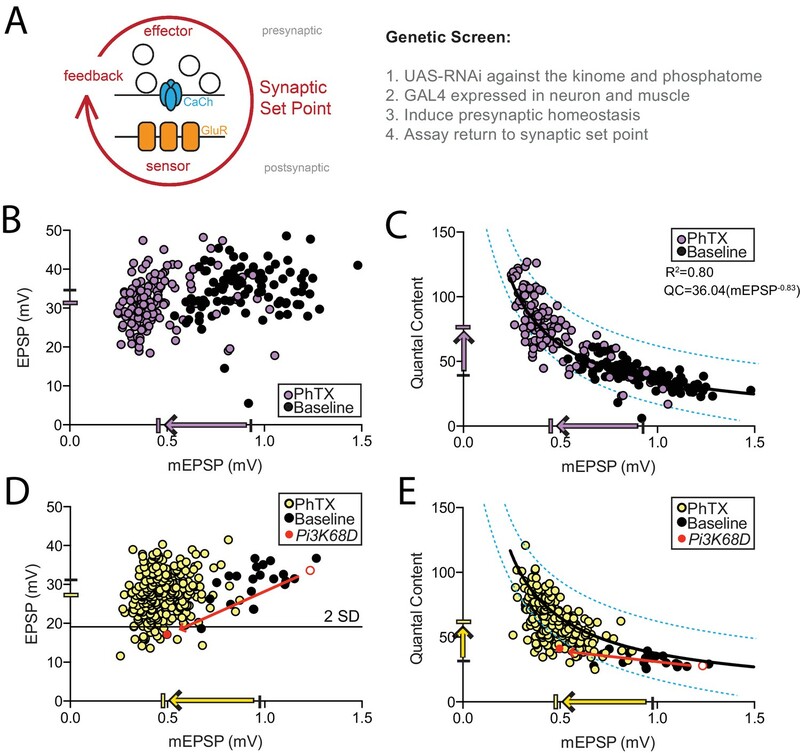 Here, we report the completion of an unbiased, forward genetic screen of the Drosophila kinome and phosphatome, and the identification of a postsynaptic signaling system for the rapid expression of PHP that is based on the activity of postsynaptic Phosphoinoside-3-Kinase (PI3K) signaling. There are three classes of PI3-Kinases, all of which phosphorylate the 3 position of phosphatidylinositol (PtdsIns). 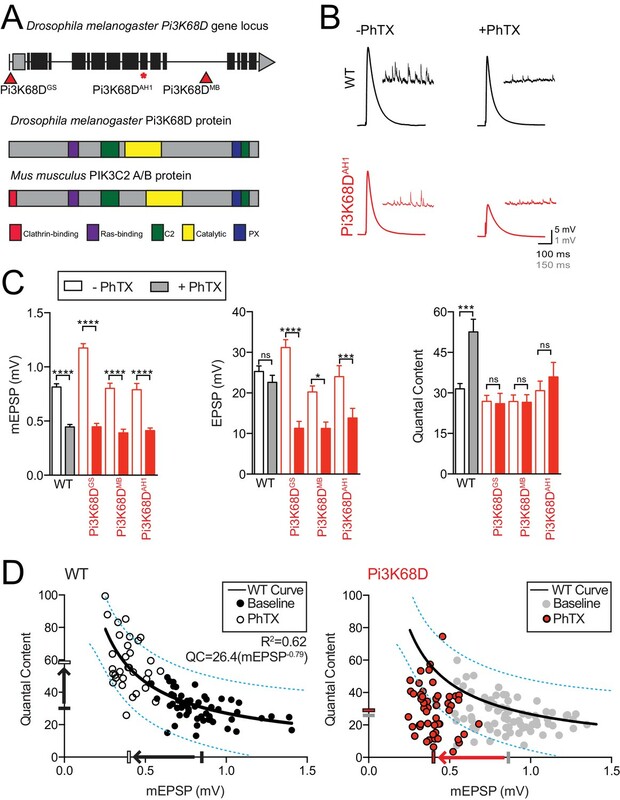 Class I PI3K catalyzes the conversion of PI(4,5)P2 to PI(3,4,5)P3 (PIP3) at the plasma membrane, enabling Akt-dependent control of cell growth and proliferation (Carracedo and Pandolfi, 2008; Vanhaesebroeck et al., 2012), and participating in the mechanisms of long-term potentiation (Knafo and Esteban, 2012). Class II and III PI3Ks (PI3K-cII and PI3K-cIII, respectively) both catalyze the conversion of PI to PI(3)P, which is a major constituent of endosomal membranes. PI(3)P itself may be a signaling molecule with switch like properties, functioning in the endosomal system as a signaling integrator (Zoncu et al., 2009). The majority of PI(3)P is synthesized by PI3K-cIII, which is involved in diverse cellular processes (Backer, 2008; Dall'Armi et al., 2013). By contrast, the cellular functions of PI3K-cII remain less well defined. PI3K-cII has been linked to the release of catecholamines (Meunier et al., 2005), immune mediators (Nigorikawa et al., 2014), insulin (Dominguez et al., 2011), surface expression and recycling of integrins (Ribeiro et al., 2011), and GLUT4 translocation to the plasma membrane, a mediator of metabolic homeostasis in muscle cells (Falasca et al., 2007). Here, we demonstrate that Class II and Class III PI3K-dependent signaling are necessary for the rapid expression of PHP, controlling signaling from Rab11-dependent, recycling endosomes. By doing so, we define a postsynaptic signaling platform for the rapid expression of PHP and define a novel action of PI3K-cII during neuronal homeostatic plasticity. To our knowledge, this is the first established postsynaptic function for PI3K-cII at a synapse in any organism. Recently, it has become clear that the endosomal system has a profound influence on intracellular signaling and neural development. There is evidence that early and recycling endosomes can serve as sites of signaling intersection and may serve as signaling integrators and processors (Irannejad et al., 2015; Villaseñor et al., 2016). Furthermore, protein sorting within recycling endosomes, and novel routes of protein delivery to the plasma membrane, may specify the concentration of key signaling molecules at the cell surface (Choy et al., 2014; Hanus and Ehlers, 2016; Issman-Zecharya and Schuldiner, 2014; Solis et al., 2017). The essential role of endosomal protein trafficking is underscored by links to synapse development (Lloyd et al., 2002; Seto et al., 2002) and neurodegeneration (Pennetta et al., 2002; Sanhueza et al., 2014). Yet, connections to homeostatic plasticity remain to be established. Based upon the data presented here and building upon prior work on endosomal signaling in other systems, we speculate that postsynatpic PI3K-cII and Rab11-dependent recycling endosomes serve as as a postsynaptic ‘homeostatic controller’ that is essential for the specificity of retrograde, transsynaptic signaling. There are at least 251 kinases and 86 phosphatases, either functionally annotated or predicted, in the Drosophila genome (Morrison et al., 2000). We used the GAL4-UAS system to drive available UAS-RNAi targeting 274 of the predicted 337 genes in the Drosophila kinome and phosphatome. UAS-RNAi were expressed in both neurons and muscle, and PHP was assessed at the third instar NMJ by direct measurement of synaptic transmission using intracellular recordings (Figure 1A). The rapid expression of PHP was assessed by application of sub-blocking concentrations of the glutamate receptor antagonist philanthotoxin-433 (PhTX; 15 μM), which causes a decrease in the amplitude of miniature excitatory postsynaptic potential amplitudes (mEPSPs) (Frank et al., 2006, Figure 1A). Excitatory postsynaptic potential amplitudes (EPSPs) initially decrease. However, within ten minutes, homeostatic signaling is engaged and drives an increase in presynaptic release (quantal content, calculated as EPSP/mEPSP). Increased presynaptic release precisely counteracts the decrease in receptor sensitivity and returns EPSP amplitudes back to the synaptic set point, baseline values. (Figure 1A; see Frank et al., 2006). First, we generated a large data set to define the baseline parameters of PHP and quantify any effect caused by the heterozygous GAL4 lines used in our screen. We assessed PHP in heterozygous GAL4 lines (GAL4/+) crossed to a wild-type genetic background by recording mEPSP and EPSP amplitudes in the absence (baseline) or presence of PhTX. The data are plotted in Figure 1B and C, with each point representing average data from an individual NMJ recording. In Figure 1B, note that mEPSP amplitudes, across all recordings, decreased by 51.4% (see arrow, X-axis; p<0.001), while the average EPSP amplitude decreased by only 9.0% (p<0.001). When mEPSP amplitudes are plotted against quantal content, a significant correlation emerges (R2 = 0.80; Figure 1C). This function (equation) defines the process of PHP whereby the magnitude of mEPSP decrease is offset by a corresponding increase in presynaptic release (quantal content). By plotting individual data, we can establish an interval that contains 95% of all data points within this control data set (blue lines). Average values and sample sizes can be found in Supplementary file 1, inclusive of data in all subsequent figures. In our screen, we quantified average mEPSP, EPSP, quantal content, muscle input resistance and muscle resting membrane potential for each combination of UAS-RNAi and GAL4 driver. The screen data are plotted (Figure 1D–E), with each point representing the average of multiple NMJ recordings for an individual genotype. The majority of individual data points shown on the graphs (94%) represent averages of more than three individual recordings, with sample sizes ranging from 2 to 14 recordings per genotype, totaling 1150 NMJ recordings. Knockdown genotypes (UAS-RNAi/GAL4) were tested in the presence of PhTX (yellow circles). A subset of genotypes was also tested in the absence of PhTX (black circles, inclusive of ~100 muscle recordings). The average mEPSP amplitude across all genotypes decreased by 51.6% (arrow X-axis; p<0.001) and the average EPSP amplitude decreased by 11.2% (p<0.001). The similarity with the control data (Figure 1B) is indicative of robust homeostatic compensation when the majority of the kinases and phosphatases were knocked down in our screen. When mEPSP amplitudes are plotted against quantal content, the majority of data reside within the confidence interval created for our control data set (Figure 1E, blue lines). Two criteria were used to select candidate PHP genes: 1) those that reside below a cutoff of −2 standard deviations from the average EPSP amplitude of the control genotypes and 2) those that reside outside the blue lines defining 95% of control data (superimposed on the screen data) (Figure 1E, blue lines). Finally, our data demonstrate that there is no correlation observed between quantal content and either resting membrane potential or muscle input resistance (Figure 1—figure supplement 1). We re-screened mEPSP and EPSP amplitudes in the presence and absence of PhTX, and identified 5 RNAi lines as verified hits from our screen (Table 1). These five lines target the PI3-Kinase Pi3K68D, the class III PI3-Kinase Vps34, the tyrosine-like kinase cdi, a putative kinase encoded by CG8726, and CamKII. In addition, we identified additional candidate plasticity genes with an apparent block of PHP (not yet independently verified) including PI4-Kinase (PI4KIIIα) and CamKK (unpublished data KJF and GWD). The discovery of Pi3K68D as well as Vps34 and, potentially PI4KIIIα, from a screen of more than 250 kinases and phosphatases, strongly implicates lipid kinase signaling in the homeostatic control of presynaptic neurotransmitter release. Pi3K68D was one of the most robust hits from the screen with a very large change in mEPSP amplitude and a similarly large decrease in EPSP amplitude (see red line on 1D), indicative of a complete block of PHP (no difference in QC, p=0.17, Figure 1D,E). We chose to initially focus on the function of Pi3K68D, in part due the robustness of the phenotype and in part because very little is known about the function of class II PI3Ks within the nervous system of any organism. As such, we have the opportunity to expand the general knowledge of lipid kinase signaling pathways and define new mechanisms underlying PHP. Pi3K68D encodes a class II PI3K with homology to the three Class II PI3Ks encoded in the mammalian genome [Figure 2A; homology to PIK3C2A is 31% identical and 48% similar (Sievers et al., 2011). In order to pursue a formal genetic analysis of Pi3K68D we examined two existing transposon insertion mutations in the Pi3K68D locus (Pi3K68DGS residing in the 5’ UTR and Pi3K68DMB residing in an intron; Figure 2A). Since neither transposon resides in coding sequence, we also used the CRISPR-Cas9 system (Kondo and Ueda, 2013) to generate a new mutation Pi3K68DAH1. This mutation is a small insertion/deletion mutation resulting in a premature stop codon at amino acid 1440, prior to the kinase domain. Presynaptic homeostatic plasticity was fully blocked in all three Pi3K68D mutations (Figure 2B,C). Unless noted, all following experiments are done with the Pi3K68DAH1 CRISPR mutant. These data confirm the results of our RNAi-based screen, identifying Pi3K68D as an essential gene for PHP. Mutations in Pi3K68D block the rapid expression of presynaptic homeostatic plasticity. (A) Top: Schematic of the Pi3K68D gene locus with mutations indicated. Below: Pi3K68D protein domains are indicated and compared to mouse class II PI3K proteins. (B) Representative EPSP and spontaneous mEPSP in wild-type (black) and mutant Pi3K68D (red), in the absence or presence of PhTX as indicated. Recordings made at 0.3 mM [Ca2+]e. (C) Average mEPSP amplitude, EPSP amplitude, and presynaptic release (quantal content) in WT, Pi3K68DGS, Pi3K68DMB, and Pi3K68DAH1. Unfilled bars are in the absence of PhTX. Filled bars are in the presence of PhTX. Mean ± SEM; ns not significant, *p<0.05, **p<0.01, ***p<0.001, and ****p<0.0001; Student’s t-test. (D) Each point represents average data from an individual NMJ recording. For WT, recordings in absence of PhTX are filled black circles while those with PhTX are unfilled black circles. For Pi3K68D, recordings in absence of PhTX are grey circles while those with PhTX are red circles. The black or grey filled hash marks on the X and Y axes represent the average mEPSP amplitude and QC, respectively, without PhTX. The white and red hash marks on the X and Y axes represent average mEPSP amplitude and QC, respectively, with PhTX. The black line in the WT graph is a curve fit to this control data. The same wild-type curve-fit is overlaid on the Pi3K68D data for purposes of comparison. Dotted blue lies encompass 95% of wild-type data points. These same lines from wild-type are superimposed on the Pi3K68D graph, at right. To further define the extent to which loss of Pi3K68D affects baseline transmission and PHP, we plotted the data for each individual NMJ recording, comparing mEPSP amplitude and quantal content (Figure 2D). Sample size for baseline recordings from Pi3K68D in the absence of PhTX includes 75 individual recordings, and 52 individual recordings in the presence of PhTX. At wild-type synapses, as shown in Figure 1, quantal content increased homeostatically as average mEPSP amplitude decreased. Again, the data are fit with an exponential function indicative of homeostatic plasticity sustaining set point postsynaptic excitation (R2 = 0.62; solid line Figure 2D, left). By contrast, Pi3K68D mutant synapses do not adhere to the wild-type homeostatic function (Figure 2D, right, red). The fit from the wild-type data set, including the interval that contains 95% of the wild-type data (blue lines), is superimposed on the Pi3K68D data. A majority of all Pi3K68D data points lie outside our 95% control data interval (defined above). There is no statistically significant change in the average QC in the presence of PhTX despite a ~ 5 fold decrease in mEPSP amplitude in Pi3K68D, implying a failure of PHP (Figure 2). We also note that there is a small but significant decrease in baseline QC (minus PhTX) in the Pi3K68D mutant background (WT QC = 30.3 ± 1.2 and Pi3K68D QC = 26.1 ± 1.2; p=0.018; see below for further analysis and discussion of baseline transmission). PHP can be induced by genetic deletion of the muscle-specific glutamate receptor subunit GluRIIA (Petersen et al., 1997). This is an independent method to induce PHP, and it has been interpreted to reflect the long-term maintenance of PHP throughout lifespan (Mahoney et al., 2014; Marie et al., 2010). Genes involved in both the rapid expression and the long-term maintenance of PHP can be considered to be ‘core’ genes necessary for PHP. We found that GluRIIA; Pi3K68DAH1 double mutant animals have decreased EPSP amplitude due to a failure to homeostatically increase quantal content (Figure 3A,B). Collectively these data show Pi3K68D is necessary for both the rapid expression and long-term maintenance of PHP and, as such, can be considered part of the core homeostatic machinery necessary for PHP. Loss of Pi3K68D blocks the sustained expression of presynaptic homeostatic plasticity. (A) Representative EPSP and spontaneous mEPSP in wild-type (black) and Pi3K68DAH1 (red), at baseline or in the presence of the GluRIIA mutation as indicated. Recordings made at 0.3 mM [Ca2+]e. (B) Average percent change in mEPSP amplitude (filled bars) and quantal content (open bars) in loss of GluRIIA compared to baseline for indicated genotypes. Statistics comparing baseline and PhTX conditions for quantal content for indicated genotypes. Mean ± SEM; ns not significant, **p<0.01; Student’s t-test. We quantified various measures of synapse development and morphology to determine whether the disruption of homeostatic plasticity in Pi3K68D mutants might be secondary to changes in synaptic structure. There was no difference in bouton number or in active zone number (as quantified by Bruchpilot, BRP, a key component of the presynaptic active zone) comparing wild-type and Pi3K68D mutants (Figure 3—figure supplement 1). We found no significant difference between wild-type and Pi3K68D mutant larva in GluRIIA receptor subunit intensity (Figure 3—figure supplement 1). There was a small but significant increase in GluRIIB intensity (16% increase compared to wild-type, p=0.01, data not shown). We found no difference in average intensity of two additional synaptic markers including Clathrin Light Chain (CLC) and cysteine string protein (CSP, Figure 3—figure supplement 1). There was a small, significant increase in synaptic anti-synaptotagmin-1 intensity (27% increase, p=0.006. Figure 3—figure supplement 1). In conclusion, we find no evidence for a substantial decrease in key presynaptic proteins, postsynaptic neurotransmitter receptors, or bouton numbers in the Pi3K68D mutant. To determine where Pi3K68D functions during PHP, pre- versus postsynaptically, we performed tissue-specific rescue experiments by expressing UAS-Pi3K68D-GFP (Velichkova et al., 2010) in the Pi3K68D mutant background. First, overexpression of UAS-Pi3K68D-GFP in motoneurons had no significant effect on baseline transmission and failed to rescue PHP when expressed in the Pi3K68D mutant background (Figure 4A). Next, muscle specific over-expression of UAS-Pi3K68D-GFP using MHC-GAL4 impaired muscle health and diminished baseline transmission (Figure 4B). Muscle-specific expression of UAS-Pi3K68D-GFP with the BG57-GAL4 driver was not viable (MacDougall et al., 2004). However, over-expression of UAS-Pi3K68D-GFP with BG57-GAL4 in the Pi3K68D mutant background was viable and fully rescued PHP (Figure 4B). Muscle recordings from these rescue animals revealed impaired muscle resting membrane potentials (RMP) due to Pi3K68D overexpression (RMP = −60.1 ± 1.3 mV without PhTX and −59.3 ± 2.4 mV with PhTX compared to the Pi3K68D mutant: −68.2 ± 1.3 mV without PhTX and −68.0 ± 1.8 mV with PhTX). We find an associated decrease in mEPSP amplitude, likely due to diminished driving force (Figure 4B). None-the-less, postsynaptic expression of Pi3K68D fully restored PHP. Thus, Pi3K68D is necessary postsynaptically for PHP. Postsynaptic Pi3K68D is necessary for presynaptic homeostatic plasticity. (A) Average data for measures as indicated, for conditions, as indicated. Genotypes tested: UAS-Pi3K68D-GFP driven by OK371-GAL4; (light grey), Pi3K68DAH1 (red), and Pi3K68DAH1 with UAS-Pi3K68D-GFP driven by OK371-GAL4; (blue). Recordings made at 0.3 mM [Ca2+]e. (B) Data as in (A). Genotypes tested WT (data re-plotted from A for direct comparison; black), UAS-Pi3K68D-GFP driven by MHC-GAL4 (grey), Pi3K68D AH1 (red), and Pi3K68D AH1 with UAS-Pi3K68D-GFP driven by BG57-GAL4 (blue). Recordings made at 0.3 mM [Ca2+]e. (C) Schematic, beginning at Pi3K68D amino acid 1441, of the mutation used to generate a kinase-dead mutant transgene. (D) Representative EPSP and spontaneous mEPSP in UAS-Pi3K68D-KD/+ (black) and UAS-Pi3K68D-KD driven by BG57-GAL4 (red), in the absence or presence of PhTX as indicated. Recordings at 0.3 mM Ca2+. (E) Average percent change in mEPSP amplitude (filled bars) and quantal content (open bars) in PhTX compared to baseline in BG57-GAL4/+ (black), UAS-Pi3K68D-KD/+ (grey), UAS-Pi3K68D-KD driven by BG57-GAL4 (red), and UAS-Pi3K68D-∆N driven by BG57-GAL4, (magenta). Muscle driver is BG57-GAL4. Mean ±SEM; ns not significant, *p<0.05, **p<0.01, ***p<0.001, ****p<0.0001; Student’s t-test. We next sought to determine whether Pi3K68D kinase activity is required for PHP. A previously published kinase dead transgene for Pi3K68D is no longer available (MacDougall et al., 2004). Therefore, we generated a new UAS-kinase-dead Pi3K68D by creating a small deletion (21 amino acids) within the kinase domain (Figure 4C), termed UAS-KD∆21-Pi3K68D. To confirm that this transgene inhibits kinase activity when expressed in a wild-type genetic background, we expressed UAS-KD∆21-Pi3K68D in the scutellar bristle lineage using ptc-GAL4. This produced supernumerary scutellar bristles, phenocopying the effects of the previously published kinase dead transgene (data not shown; MacDougall et al., 2004). When we over-expressed UAS-KD∆21-Pi3K68D in muscle, PHP was blocked (Figure 4C and D). A C-terminal m-Cherry tag allowed us to determine that the transgene was expressed in muscle (data not shown). In addition, muscle overexpression of UAS-KD∆21-Pi3K68D (BG57-GAL4) had no adverse effect on muscle health, unlike over-expression of wild-type Pi3K68D with BG57-GAL4, which causes lethality (see above). From these data, we conclude that the kinase activity of Pi3K68D is necessary for PHP. These data further confirm that Pi3K68D is necessary, in muscle, for PHP. The N-terminal amino acids of mammalian PIK3C2A and PIK3C2B have a regulatory function, binding Clathrin and regulating the activity of the kinase (Gaidarov et al., 2005; Wheeler and Domin, 2006). Therefore, we sought to test whether disrupting this regulatory function would alter the rapid expression of PHP. We generated an N-terminal Pi3K68D deletion, removing the orthologous first 363 amino acids, termed UAS-Pi3K68D-ΔN. When we over-expressed UAS-Pi3K68D-ΔN in muscle, PHP was blocked (Figure 4E). When Pi3K68D-ΔN protein localization was followed using an N-terminal mCherry tag, it was apparent that the transgene is more diffuse compared to the punctate distribution of a wild-type UAS-Pi3K68D-GFP transgene (see below and data not shown). We conclude that either proper kinase localization or regulation, potentially via Clathrin binding, is essential for robust homeostatic signaling. Collectively, these results demonstrate a required postsynaptic function of Pi3K68D for presynaptic homeostatic plasticity. The genes encoding Rab3 Interacting molecule (RIM; Müller et al., 2012), a central player in the presynaptic cytomatrix, and Multiplexin (DMP; Wang et al., 2014), a component of the extracellular matrix and precursor to Endostatin, have been shown to be required for PHP. Since homozygous mutations in each gene block PHP, we cannot perform standard double mutant genetic epistasis experiments. However, it has been possible to test double heterozygous mutant combinations for a block in PHP, thereby implicating genes in a common process, even if it is not possible to order them in single signaling pathway (Frank et al., 2009; Harris et al., 2015; Wang et al., 2014). Here we demonstrate that heterozygous mutations for Pi3K68D/+ as well as rim/+ and dmp/+ all express normal PHP (Figure 5A,B). However, trans-heterozygous animals for Pi3K68D and rim show a complete block in PHP (Figure 5A,B). In addition, trans-heterozygous animals for Pi3K68D and dmp show a statistically significant suppression of homeostatic plasticity (Figure 5A,B). These data are consistent with Pi3K68D functioning within a homeostatic signaling system inclusive of previously identified PHP genes. Since RIM is a presynaptic protein and Pi3K68D acts postsynaptically, these data further imply that these genes participate, at some level, in a trans-synaptic signaling system necessary for PHP. Pi3K68D interacts genetically with rim and dmp. (A) Representative traces for EPSP and mEPSP in heterozygous controls (Pi3K68D AH1/+; black) and double heterozygous mutants Pi3K68D AH1/rim103 (red) and Pi3K68D AH1/dmpf0 (red) in the absence or presence of PhTX, as indicated. Recordings made at 0.3 mM [Ca2+]e. (B) Average percent change in mEPSP amplitude (filled bars) and quantal content (open bars) in PhTX compared to baseline in heterozygous controls: Pi3K68D AH1/+ (black), rim103/+ (black), and dmpf0/+ (black) and double heterozygous mutants: Pi3K68D AH1/rim103 (red) and Pi3K68D AH1/dmpf0 (red). Multiplexin is a extracellular matrix protein, and its cleavage product Endostatin is hypothesized to act as a retrograde signal during PHP (Wang et al., 2014). Expression of UAS-endostatin in neurons or muscles rescues dmp mutants during PHP, consistent with a requirement for Endostatin being secreted into the synaptic cleft. Because dmp and Pi3K68D showed a genetic interaction as trans-heterozygotes (strong suppression of PHP), we hypothesized that Pi3K68D may be necessary for the secretion of Endostatin. In this model, expression of UAS-endostatin would rescue PHP in Pi3K68D mutants. We expressed UAS-endostatin in the muscle of Pi3K68D mutants and found that homeostatic plasticity was still blocked (Figure 5—figure supplement 1). In this condition, we confirmed that Pi3K68D mutants do not inhibit secretion of Endostatin-GFP by labeling surface GFP under non-cell permeabilizing conditions (Figure 5—figure supplement 1). As a control for exclusive labeling of secreted protein, we demonstrate that a highly over-expressed cytoplasmic GFP shows not labeling under non-cell permeabilizing conditions (see S6K-GFP, an intracellular protein tagged with GFP). Therefore, we conclude that secreted Endostatin is not sufficient to rescue the defect in PHP in Pi3K68D mutants. As such, it is unlikely that impaired PHP is due to a failure to release Multiplexin or proteolytically process Muliplexin into Endostatin within the synaptic cleft. The class II PI3 kinases (PI3K-cII) remain poorly characterized, particularly when compared to other components of lipid and endosomal signaling systems. It has been reported in other cell biological systems that PI3K-cII binds to Clathrin and is activated, in part, through this interaction (Domin et al., 2000; Gaidarov et al., 2005; Wheeler and Domin, 2006). In addition, PI3K-cII drives the generation of the lipid PI(3)P (MacDougall et al., 2004), which defines an early endosomal membrane system (Posor et al., 2015). A plausible scenario for the localization and function of PI3K-cII in the secretory pathway is diagrammed (Figure 6A,B). This model serves as a guide to our experiments (below). The role of Pi3K68D in endosomal and trans-Golgi signaling. (A) A model of the Golgi and endosomal system illustrating proteins explored in this and subsequent figures. (B) A schematic of the NMJ, muscles 6 and 7. Large circles depict muscle nuclei. Synaptic boutons are outlined in black and filled gray. Dotted box indicates a region of interest (ROI). The ROI, expanded below, reveals the edge of a nucleus, and puncta defined by Pi3K68D (green) and CLC (magenta). This schematizes images presented in C-E. (C) Muscle ROI in WT and animals expressing UAS-Pi3K68D-GFP in muscle (MHC-GAL4). Staining as indicated; GFP (green) and CLC (magenta or white in WT image). Nuclei are outlined with a white dotted line. Insets at right. (D) ROI in muscle expressing GalT-YFP (trans-Golgi). Staining as indicated. Select puncta shown at higher magnification (right). (E) Muscle ROI in WT and Pi3K68D AH1 expressing UAS-2xFYVE-GFP. Staining as indicated. Nuclei as in (C). (F) FYVE-GFP puncta area and number per muscle ROI. Black is control (FYVE-GFP/+;BG57-GAL4/+). Red is FYVE-GFP/+;BG57-GAL4, Pi3K68D AH1/Pi3K68D AH1. Number of synapses: WT N = 10, Pi3K68D N = 9. (G) Rab11 mean intensity and puncta number per muscle ROI. WT (black) versus Pi3K68D AH1 (red). Number of synapses: WT N = 10, Pi3K68D N = 7. (H) Mean intensity per ROI of Rab5. WT (black) versus Pi3K68D AH1 (red). Number of synapses: WT N = 12, Pi3K68D N = 11. Mean ±SEM; ns not significant, *p<0.05, **p<0.01, ***p<0.001, and ****p<0.0001; Student’s t-test. To visualize the subcellular localization of Pi3K68D, we expressed UAS-Pi3K68D-GFP in muscle, co-stained with anti-Clathrin Light Chain (CLC) (Heerssen et al., 2008) and imaged the preparation using super-resolution structured illumination microscopy (Pielage et al., 2008). 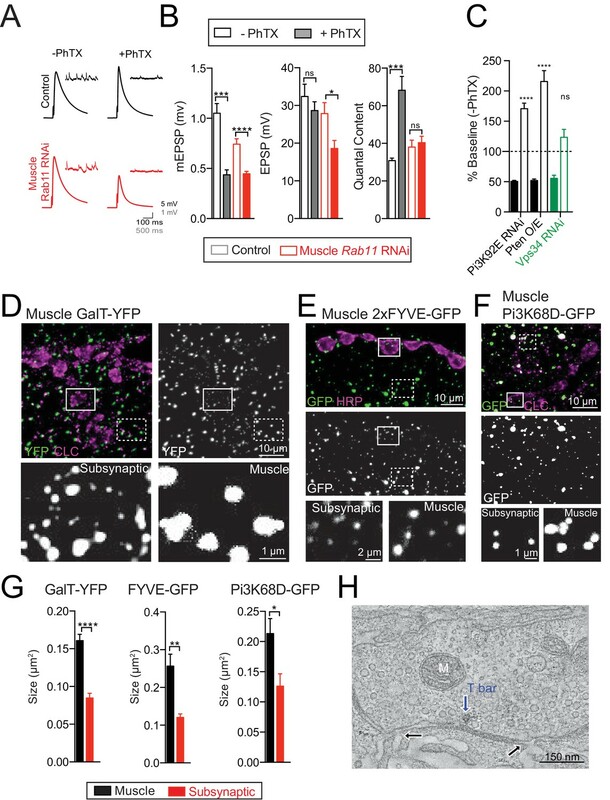 We demonstrate that Pi3K68D-GFP forms endosomal like structures that precisely co-localize with CLC throughout muscle, concentrating near the muscle surface (Figure 6C). The highly regular distribution of Pi3K68D puncta is reminiscent of the distributed Golgi system in skeletal muscle, observed in mammals (Ralston et al., 2001) and Drosophila (Johnson et al., 2015). Therefore, we attained YFP or GFP-tagged markers of the medial and trans-Golgi (Ye et al., 2007). We tested for co-localization of our Golgi markers with CLC antibody staining, since anti-CLC is co-localized with Pi3K68D-GFP. We find that CLC and trans-Golgi-YFP (GalT-YFP) reside in closely associated vesicular compartments throughout muscle (Figure 6D). This finding is confirmed by use of a second medial Golgi-GFP marker (UAS-ManII-GFP) (Figure 6—figure supplement 1). We conclude that Pi3K68D is present on a Golgi-derived, Clathrin-positive membrane compartment, consistent with prior work in other systems (Domin et al., 2000; Wheeler and Domin, 2006). We next determined whether Pi3K68D is responsible for the generation of PI(3)P by quantifying the distribution of a UAS-2xFYVE-GFP transgene, encoding a FYVE-domain protein that directly binds to PI(3)P (Hammond and Balla, 2015). We found that Pi3K68D mutants have dramatically fewer, smaller FYVE-GFP puncta compared to wild-type larvae (Figure 6E,F). As a control, we quantified CLC levels in the same muscles and find that they are unaffected (Figure 6—figure supplement 2). 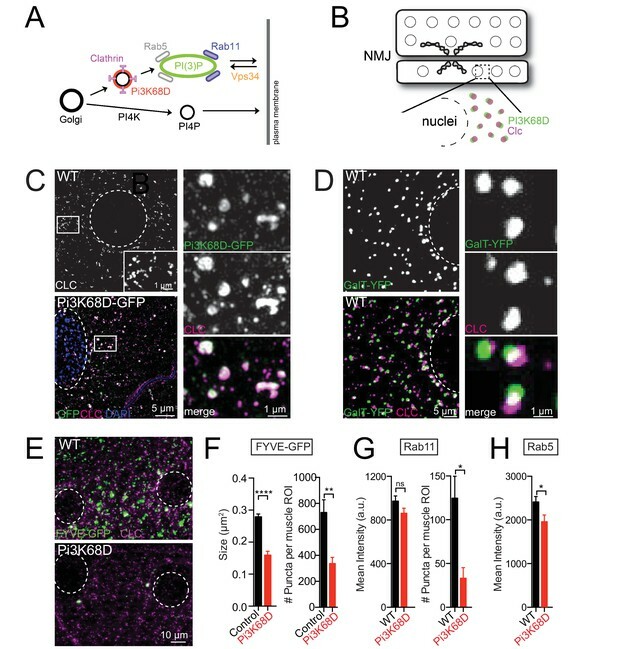 Furthermore, FYVE-GFP puncta do not co-localize with CLC, consistent with the presence of Pi3K68D on an intermediate endosomal membrane that is required for the formation of PI(3)P-positive endosomes. Thus, Pi3K68D is required to generate a significant fraction of PI(3)P in postsynaptic muscle, a necessary step in the formation of early endosomes in other systems (Posor et al., 2015). It has been established that PI(3)P production at the early endosome recruits effectors that sort proteins to late endosomes, autophagosomes, or recycling endosomes (Posor et al., 2015). The proteins Rab5, Rab7, and Rab11 mark early endosomes, late endosomes, and recycling endosomes respectively (Grant and Donaldson, 2009). We quantified endogenous protein levels of Rab5, Rab7, and Rab11 in the muscle of wild-type and Pi3K68D mutant larva. Rab5, 7, and 11 are all enriched at the synapse, but we cannot differentiate between pre-and postsynaptic proteins by antibody staining. Therefore, we focused our examinations in regions of interest in the muscle, adjacent to the synapse. We found that loss of Pi3K68D does not affect total muscle protein levels of Rab11, but there is a significant drop in the number of Rab11-positive puncta (124.7 in WT versus 33.14 in Pi3K68D mutant, p=0.01; Student’s t-test, two tailed; Figure 6G). We also examined levels of Rab5 in the Pi3K68D mutant and found that mean intensity in the muscle ROI also decreased (Figure 6H). The Rab5-positive puncta could not be sufficiently resolved to quantify puncta number. Finally, we find that total Rab7 protein increased in the Pi3K68D mutant (quantified by mean intensity), but the number of Rab7-positive puncta did not change (Figure 6—figure supplement 2). These data are consistent with the depletion of PI(3)P in the Pi3K68D mutant background causing impaired Rab11 recruitment to endosome derived vesicles that recycle to and from the plasma membrane. If so, this membrane trafficking system could be a signaling platform required for the rapid expression of PHP. Rab11-positive endosomes are often referred to as recycling endosomes. These endosomes receive cargo, sorted within the PI(3)P positive endosome, and recycle the cargo back to the plasma membrane, thereby controlling the steady state concentration of important signaling molecules at the plasma membrane (Choy et al., 2014; Issman-Zecharya and Schuldiner, 2014; Zhang et al., 2011). We specifically knocked down Rab11 in muscle using a published UAS-Rab11-RNAi transgene (Beckett et al., 2013; Dietzl et al., 2007; Xiong et al., 2012) and a muscle-specific source of GAL4 (BG57-GAL4). We found that PHP was completely blocked (Figure 7A,B). It seems reasonable to conclude that the impaired Rab11 recruitment to early endosomes, and impaired generation/function of recycling endosomes, is responsible for the block of PHP in the Pi3K68D mutant. Sub-synaptic specialization of a trans-Golgi network. (A) Representative traces for controls (BG57-GAL4/+; black) and UAS-Rab11-RNAi driven in muscle (red; BG57-GAL4) in the absence or presence of PhTX, as indicated. Recordings at 0.3 mM [Ca2+]e. (B) Genotypes tested are control (BG57-GAL4/+; grey) and UAS-Rab11-RNAi (red; muscle-expression via BG57-GAL4). (C) Average percent change in mEPSP amplitude (filled bars) and quantal content (open bars) in PhTX compared to baseline. UAS-Pi3K92E-RNAi (black; muscle-expression via MHC-GAL4), UAS-Pten over-expression (black; muscle-expression via BG57-GAL4), and UAS-Vps34-RNAi (green; muscle-expression via MHC-GAL4). (D) ROI from muscle expressing GalT-YFP using MHC-GAL4; GFP (green) and CLC (magenta). Insets directly below; dotted box muscle ROI, solid box synaptic ROI. (E) ROI as in (D) for muscle expressing 2X-FYVE-GFP using BG57-GAL4. GFP (green) and HRP (magenta). (F) ROI as in (D) for muscle expressing Pi3K68D-GFP using MHC-GAL4. GFP (green) and CLC (magenta). (G) Quantification of the area of GalT-YFP (Number of synapses: N = 10), FYVE-GFP (Number of synapses: N = 13), or Pi3K68D-GFP puncta (Number of synapses: N = 9), in a WT muscle ROI (black) vs. synaptic ROI (red). (H) Computational slice from EM tomogram of a bouton illustrating invaginations of muscle membrane (black arrows) opposite an active zone (as indicated by the blue arrow showing T-bar). M = mitochondria. Mean ±SEM; ns not significant, *p<0.05, **p<0.01, ***p<0.001, and ****p<0.0001; Student’s t-test for figure (B and G). In most biological systems, the formation of the recycling endosomal compartment requires the action of a class III PI3K (PI3K-cIII, Figure 6A), referred to here as Vps34 for consistency with the yeast nomenclature. The Vps34 complex has been studied extensively and is thought to be the primary mechanism for generating intracellular pools of PI(3)P that are required for recycling endosome transition to and from the plasma membrane (Backer, 2008; Dall'Armi et al., 2013; Juhász et al., 2008). Importantly, in our unbiased forward genetic screen, we also identified the Drosophila orthologue of a class III PI3K (Vps34, Table 1). This is the only gene in Drosophila that encodes a class III PI3K and should, therefore, be required in muscle for recycling endosome formation and function. We asked whether Drosophila Vps34 is required in muscle for PHP. Vps34 null mutations are third-instar lethal (Juhász et al., 2008). Never-the-less, we confirmed the results of our genetic screen that muscle specific knockdown of Vps34 blocks PHP (Figure 7C). Thus, three independent genes, two of which were derived from the results of a forward genetic screen, highlight an essential role for postsynaptic recycling endosomes in the rapid expression of PHP. Finally, we thought it important to test whether a generalized disruption of the muscle lipid kinase signaling system might interfere with PHP. Therefore, to complete our analysis, we assessed whether the Drosophila class I PI3K might also be necessary, in muscle, for PHP. We found that PHP was normal when we expressed UAS-RNAi to knock down class I PI3K (Pi3K92E) in muscle (Figure 7C). To further address this possibility, we over-expressed the Pten phosphatase (Huang et al., 1999), which acts to oppose the kinase activity of class I Pi3K. This also had no effect on the induction of PHP (Figure 7C). Functionally, the class I PI3K generates PI(3,4,5)P3 and is linked to insulin and TOR signaling (Knafo and Esteban, 2012). The lack of an observed effect on the rapid expression of PHP is consistent with prior observations that TOR and S6K act in muscle in a translation-dependent manner to consolidate or maintain expression of PHP, but are dispensable for the rapid expression process (Penney et al., 2012). The time-course of PHP induction, occurring in seconds to minutes, implies the existence of mechanisms to control the secretion of retrograde signaling molecules at the postsynaptic side of the active zone. Recent work has demonstrated that Synaptotagmin- 4 and Syntaxin- 4 control the secretion of growth factors at the postsynaptic side of the NMJ (Akbergenova and Littleton, 2017; Harris et al., 2016; Rodal et al., 2011). However, syt4 mutations were found to have normal PHP (Dickman and Davis, 2009). Thus, a separate secretory system must be involved in the rapid expression of PHP. When examining the distributed Golgi system in Drosophila muscle, we discovered that Golgi adopt a distinct morphology within the postsynaptic membranes at the NMJ. In this region, Golgi are statistically significantly smaller and appear more dense than in the surrounding muscle (Figure 7D,G). Similarly, puncta of FYVE-GFP and Pi3K68D-GFP are significantly smaller and more densely packed in the subsynaptic region (Figure 7E–G). While the functional relevance of this distinction remains unclear, it is clear that the entire secretory system, inclusive of Golgi, and endosomes are concentrated to the postsynaptic membrane system where it is poised to participate in retrograde, homeostatic signaling, among other synaptic functions. Finally, we have employed 3D TEM tomography to examine the architecture of the SSR to explore the interface of the neuronal and endosomal membrane systems at the NMJ. The postsynaptic muscle membranes at the Drosophila NMJ are termed the sub-synaptic reticulum (SSR). The SSR is a complex, multi-layered membrane structure that envelops the nerve terminal. It is well established that endosomal and secretory proteins localize to the SSR and, in some cases, concentrate at this structure (Akbergenova and Littleton, 2017). But, because the SSR membrane architecture is so complex (~1 µM thick), it remains unclear how the pre- and postsynaptic membranes of the nerve terminal interface with the SSR membrane system. 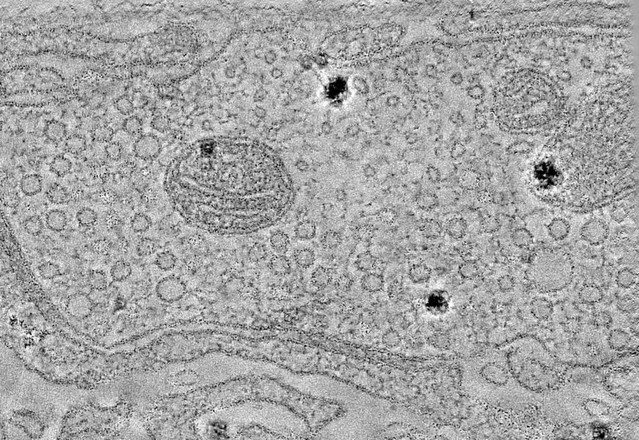 Employing 3D TEM tomography (see Materials and methods), we reveal that the postsynaptic plasma membrane often invaginates into the SSR membrane system at sites that are directly adjacent to the active zone. Active zones are defined as sites of electron density between the pre- and postsynaptic plasma membranes, clustered presynaptic vesicles and the presence of a presynaptic T-bar (Figure 7H; Video 1). The sites of postsynaptic membrane invagination occur directly adjacent to the tightly opposed membranes of the synaptic cleft, creating a postsynaptic membrane that is in direct proximity to the SSR membranes and, by extension, in close proximity to the muscle endosomal and secretory signaling systems. Finally, the synaptic cleft also becomes continuous with the inter-cellular spaces within the SSR. This organization would facilitate the exchange of signaling information between the muscle and synapse, perhaps enabling the type of rapid, homeostatic signaling that is characteristic of PHP. An electron microscopy tomogram to examine the NMJ, showing invaginations of muscle membrane opposite an active zone. In order to explore why PHP fails following loss of Pi3K68D, we examined the rapid expression of PHP across a range of extracellular calcium concentrations, from 0.3 to 1.5 mM [Ca2+]e. Remarkably, while PHP remained completely blocked at 0.5 mM [Ca2+]e, PHP was restored in the range of 0.7–1.5 mM [Ca2+]e. Indeed, there is a switch-like transition in the expression of PHP between 0.5 and 0.7 mM [Ca2+]e (Figure 8A,B). 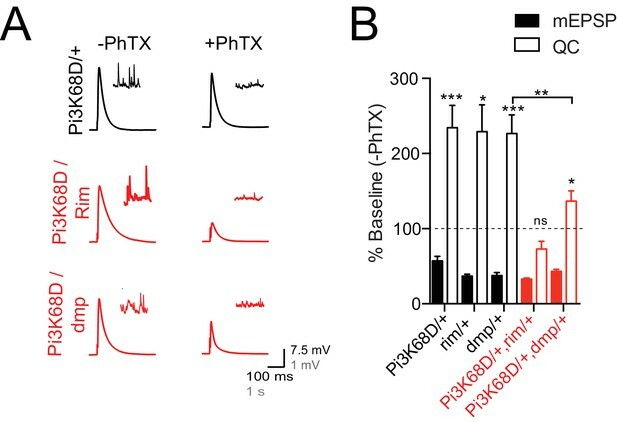 This is clearly observed by plotting the percent reduction in mEPSP amplitude caused by the application of PhTX versus the percent change in presynaptic release (quantal content), which defines the homeostatic response to PhTX application (Figure 8B). Calcium dependence of homeostatic plasticity in Pi3K68D mutants. (A) Representative traces at 0.5 mM (A) and 1.5 mM (B) [Ca2+]e, in the absence or presence of PhTX as indicated. (B) Percent decrease mEPSP due to PhTX application is plotted against the percent increase in quantal content for the indicated calcium concentrations (inset). Red arrow highlights block of PHP at 0.3 and 0.5 mM [Ca2+]e. (C) Average percent change for mEPSP (filled bars) and quantal content (open bars) for Pi3K68D AH1;GluRIIAsp16 double mutants compared to Pi3K68D mutant alone. Recordings at 1.5 mM [Ca2+]e. (D) Average EPSC amplitude at 0.5, 0.7, and 1.5 mM [Ca2+]e as indicated for WT (black) and Pi3K68D AH1 (red). (E) Representative EPSCs during a stimulus train, calcium as indicated. WT (black) or Pi3K68D AH1 (red). (F) Cumulative EPSC (left), Ptrain (middle) and EPSC4/EPSC1 (right). WT (black) or Pi3K68D AH1 (red). Mean ±SEM; ns not significant, *p<0.05, **p<0.01, ***p<0.001 Student’s t-test. We performed several additional experiments to explore the switch-like calcium sensitivity of PHP in Pi3K68D mutants. First, PHP is blocked at 0.3 mM [Ca2+]e in the Pi3K68D-GluRIIA double mutant (see above), but normally expressed at 1.5 mM [Ca2+]e (Figure 8C). Since the Pi3K68D-GluRIIA double mutants develop at elevated calcium in vivo (1.5 mM [Ca2+]e is the assumed average physiological calcium concentration), PHP must have been induced and fully expressed throughout larval life. 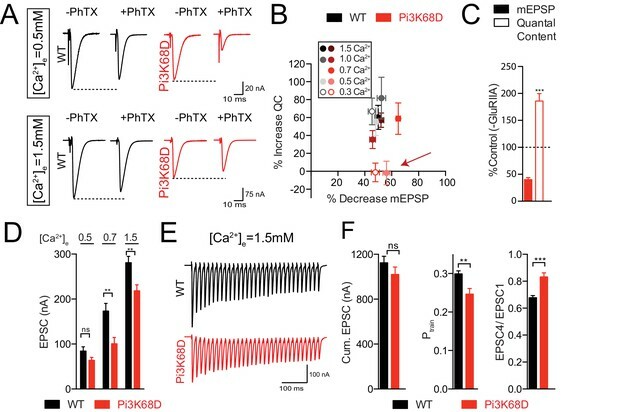 Thus, loss of postsynaptic Pi3K68D must render the presynaptic expression mechanism sensitive to lower concentrations of extracellular calcium. We confirmed this conclusion by incubating the Pi3K68D mutant in PhTX at 0.3 mM [Ca2+]e. Then, we immediately switched the preparation to 1.5 mM [Ca2+]e and found that PHP is fully expressed. Thus, the presynaptic expression of PHP has been rendered acutely calcium sensitive in Pi3K68D. One possible explanation for the switch-like, calcium-dependence of PHP is that loss of Pi3K68D is somehow compensated by changes in Vp34 expression or activity, partially substituting for loss of Pi3K68D (note, however, that PI(3)P levels are substantially diminished in Pi3K68D, see above). To address this, we generated double heterozygous animals of Vps34/+ and Pi3K68D/+, but find that PHP is normally expressed (data not shown). Next, we removed one copy of Vps34/+ from the Pi3K68D homozygous mutant and, again, we find that PHP is fully expressed at 1.0 mM [Ca2+]e (Figure 8—figure supplement 1). It remains impossible to completely eliminate possible compensation by Vps34, since this gene is essential for viability. However, it does not appear that enhanced Vps34 expression is substituting for the loss of Pi3K68D. Finally, we note that baseline neurotransmitter release appears to be differentially affected by changing extracellular calcium in Pi3K68D. Therefore, we explored the possibility that altered release is related to the switch-like effect of external calcium on PHP expression. Presynaptic release is wild-type when recordings are made at 0.5 mM [Ca2+]e (Figure 8D). However, in the range of 0.7–1.5 mM [Ca2+]e we find a significant deficit in average EPSC amplitude (Figure 8D), without a change in mEPSP amplitude (Supplementary file 1). Consistent with a change in presynaptic release, we observe a decrease in presynaptic release probability during short, high-frequency stimulus trains (Ptrain; see Materials and methods) and decreased short-term synaptic depression (Figure 8E–F). However, the observed decrease in presynaptic release cannot be causally linked to impaired PHP. Three independent postsynaptic manipulations cause impaired PHP at low extracellular calcium without altering PHP at elevated calcium and without affecting presynaptic release at elevated calcium (Supplementary file 1). These manipulations include: (1) postsynaptic expression of the Pi3K68D kinase dead transgene, (2) postsynaptic knockdown of Rab11 and (3) postsynaptic knockdown of Vps34. In all manipulations, PHP is impaired at 0.3 mM [Ca2+]e (Figures 4E and 7A) but restored at 1.5 [Ca2+]e with no defect in baseline transmission (Supplementary file 1). 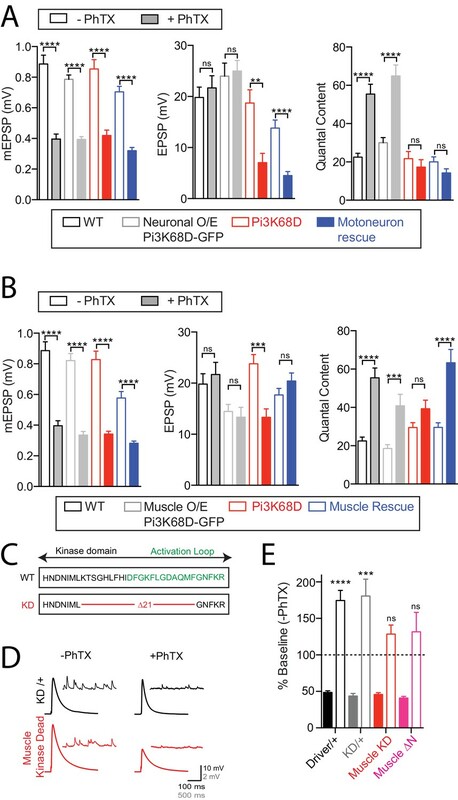 Note that impaired muscle health caused by muscle over-expression of wild-type Pi3K68D precludes two-electrode voltage clamp experiments and, therefore, analysis of postsynaptic rescue of baseline neurotransmission. We have screened the Drosophila kinome and phosphatome for genes that control the rapid expression of PHP. This screen identified three components of a conserved, postsynaptic lipid signaling pathway that is essential for the robust expression of PHP including: (1) class II PI3K, (2) class III PI3K (Vps34) and a gene encoding the Drosophila orthologue of PI4K (not examined in detail in this study). We go on to demonstrate that Pi3K68D is essential, postsynaptically for PHP. Pi3K68D resides on a Clathrin-positive membrane compartment that is positioned directly adjacent to Golgi membranes, throughout muscle and concentrated at the postsynaptic side of the synapse. Pi3K68D is necessary for the maintenance of postsynaptic PI(3)P levels and the recruitment of Rab11 to intracellular membranes, likely PI(3)P-positive recycling endosomes. Postsynaptic Rab11 and Vps34 knockdown block PHP in an unusual, calcium-dependent manner that phenocopies Pi3K68D. Thus, we have identified a postsynaptic signaling platform, centered upon the formation of PI(3)P and Rab11-positive recycling endosomes, that is essential for PHP. We first consider whether postsynaptic Pi3K68D, Vps34 and Rab11 might alter PHP through modulation of postsynaptic glutamate receptor abundance. There is no consistent change in mEPSP amplitude in Pi3K68D mutants or following muscle-specific knockdown of Rab11 or Vps34 that could account for altered PHP. Therefore, functionally, there is no evidence for a change in glutamate receptor abundance at the postsynaptic membrane that could drive the phenotypic effects we observe. Anatomically, we also present data examining GluR staining levels. In the Pi3K68D mutants, we find no change in GluRIIA levels. GluRIIA subunit containing receptors are the primary mediator of PhTx-dependent PHP (Frank et al., 2006). We also report a very modest (16%), though statistically significant, increase in GluRIIB levels. Based on these combined data, it seems unlikely that a change in GluR trafficking is a causal event leading to altered expression of PHP. We note that previous work showed limited GluRIIA receptor mobility within the PSD at the Drosophila NMJ (Rasse et al., 2005). Thus, we speculate that the function of Pi3K68D, Vps34 and Rab11 during PHP is not directly linked to postsynaptic GluR trafficking. Any model to explain the role of PI3K, Vps34 and Rab11-dependent endosomal signaling during homeostatic plasticity must account for the phenotypic observation that PHP is only blocked at low extracellular concentrations. More specifically, in animals deficient for Pi3K68D, Rab11 or Vps34, PHP is fully expressed at elevated calcium, following PhTX application or in the GluRIIA mutant. However, PHP completely fails when extracellular calcium is acutely decreased (following induction) below 0.7 mM [Ca2+]e. Clearly, the PHP induction mechanisms remain fully intact. Instead, the presynaptic expression of PHP has been rendered calcium-dependent. It is important to note that PHP can be fully induced in the absence of extracellular calcium, so the concentration of calcium itself is not the defect (Frank et al., 2009). In addition, we document trans-heterozygous interactions of Pi3K68D with presynaptic rim and dmp, arguing for the loss of trans-synaptic signaling and a specific function of Pi3K68D in the mechanisms of PHP. In very general terms, we conclude a PI3K and Rab11-dependent endosomal signaling platform is necessary to enable the normal expression of PHP. Ultimately, some form of retrograde signaling must be defective due to either: 1) the absence of a retrograde signal that should have normally participated in PHP or 2) the presence of an aberrant or inappropriate signal that dominantly obstructs normal PHP expression. Here, we consider both of these ideas in greater depth. First, we consider the possibility that the absence of postsynaptic PI3K and Rab11 signaling could alter the molecular composition or development of the presynaptic terminal due to the persistent absence of a retrograde signal that controls generalized synapse development or growth. Several observations demonstrate that impaired PHP is not a secondary consequence of a general defect in synapse development. We report three independent postsynaptic manipulations (postsynaptic expression of kinase dead Pi3K68D, postsynaptic knockdown of Rab11, and postsynaptic knockdown of Vps34) that have no effect on presynaptic release at any [Ca2+]e, yet block PHP at low [Ca2+]e. In addition, we find no obvious defect in anatomical synapse development (Figure 3—figure supplement 1). Next, we consider the possibility that postsynaptic PI3K and Rab11 signaling eliminate a retrograde signal that is specific for PHP. We recently demonstrated that Semaphorin2b (Sema2b) and PlexinB (PlexB) define a retrograde signal at the Drosophila NMJ that is necessary for PHP (Orr et al., 2017). However, both Sema2b and PlexB are essential for the rapid induction of PHP, inclusive of experiments at low and elevated extracellular calcium. Further, acute application of recombinant Sema2b is sufficient to fully induce PHP. Since the induction of PHP remains fully intact in the Pi3K68D mutant, and since PHP is rendered calcium sensitive, it suggests that altered Sema2b secretion is not the cause of impaired PHP in the Pi3K68D mutant. Never-the-less, this possibility will be directly tested in the future. Next, we consider the possibility that the loss of PI3K and Rab11 signaling causes aberrant or inappropriate retrograde signaling, thereby impairing the expression of PHP. This is a plausible scenario because the induction of presynaptic homeostatic plasticity suffers from a common problem inherent to many intra-cellular signaling systems: two incompatible outcomes (1. presynaptic homeostatic potentiation and 2. presynaptic homeostatic depression - PHD) are produced from a common input, and it remains unclear how signaling specificity is achieved. The topic of signaling specificity has been studied in several systems. One system, budding yeast, is a good example. Different pheromone concentrations can induce several distinct behaviors in budding yeast despite having a common input (pheromone concentration) and underlying signaling systems (Saito, 2010; Schwartz and Madhani, 2004). Signaling specificity degrades in the background of mutations that affect Map Kinase scaffolding proteins (Schwartz and Madhani, 2004). In a similar fashion, presynaptic homeostatic plasticity is induced by a change in mEPSP amplitude. A decrease in mEPSP amplitude causes the induction of PHP, whereas an increase in mEPSP amplitude causes the induction of presynaptic homeostatic depression (PHD) (Daniels et al., 2004; Gaviño et al., 2015). If a common sensor is employed to detect deviations in average mEPSP amplitude, how is this converted into the specific induction of either PHP or PHD? It has been shown that PHD and PHP can be sequentially induced (Gaviño et al., 2015). But, it remains unknown what would happen if the mechanisms of PHP and PHD were simultaneously induced. Under normal conditions this would never occur because mEPSP amplitudes cannot be simultaneously increased and decreased. But, if signaling specificity were degraded in animals lacking postsynaptic PI3K or Rab11, then the expression of PHP and PHD might coincide and create a mechanistic clash within the presynaptic terminal (Figure 9). Model for the control of PHP and PHD from an endosomal ‘controller’. (A) A model of homeostatic feedback control inclusive of feedback for both PHP and PHD. The sign for modulation of presynaptic release is indicated. We speculate that signaling pathway cross-inhibition allows for either PHP (red) or PHD (blue) to be selectively induced. When mEPSP amplitudes are decreased (PhTX), this is detected by the sensor and differs from the synaptic set point, causing an error signal to be generated. The error is then relayed to a homeostatic ‘controller’ where the error is integrated and signaling is induced corresponding to the specific induction of either PHP (red) or PHD (blue). We propose that cross pathway inhibition at the level of the controller allows for the specific induction of either PHP or PHD. We propose that the ‘controller’ is organized within the PI3K and Rab11-depedent recycling endosomal signaling platform and that loss of this signaling platform leads to inappropriate induction of PHD in the presence of PhTX, causing a mechanistic clash at the level of the presynaptic terminal. (B) A model of the neuromuscular junction, highlighting mechanisms of PHP in red (increased calcium influx, increased RRP, and increased vesicle coupling) and PHD in blue, for which very little is understood mechanistically. Signaling and recycling endosomes are, in many respects, ideally suited to achieve signaling specificity during homeostatic plasticity. Signaling specificity can be achieved by mechanisms including sub-cellular compartmentalization of pathways, physically separating signaling elements with protein scaffolds, or through mechanisms of cross-pathway inhibition (Bardwell et al., 2007; Haney et al., 2010; Schwartz and Madhani, 2004). Well-established mechanisms of protein sorting within recycling endosomes could physically compartmentalize signaling underlying PHP versus PHD (Cullen, 2008; Grant and Donaldson, 2009). Alternatively, recycling endosomes can serve as a focal point for signal digitization, integration, and, perhaps, cross-pathway inhibition (Irannejad et al., 2013, 2015; Villaseñor et al., 2015; Villaseñor et al., 2016). Thus, we propose that the loss of postsynaptic PI3K and Rab11 compromises the function of the postsynaptic endosomal platform that we have identified, thereby degrading homeostatic signaling specificity. As such, this platform could be considered a ‘homeostatic controller’ that converts homeostatic error signaling into specific, homeostatic, retrograde signaling for either PHP or PHD. One such scenario is proposed in Figure 9. We have also considered other models, but do not favor them. It remains formally possible that the calcium-sensitivity of PHP expression could be explained by a partially functioning PHP signaling system. This seems unlikely given that the same phenotype is observed in four independent genetic manipulations including a null mutation in Pi3K68D, postsynaptic expression of kinase dead Pi3K68D, postsynaptic knockdown of Rab11, and postsynaptic knockdown of Vps34. Furthermore, prior experiments examining hypomorphic and trans-heterozygous genetic interactions among essential PHP genes suggest that PHP is either diminished across the entire calcium spectrum or fully functional (Davis and Müller, 2015; Genç et al., 2017; Harris et al., 2015; Orr et al., 2017; Wang et al., 2016; Younger et al., 2013). So, there is no evidence that partial disruption of PHP could account for calcium-sensitive expression of PHP. Finally, our experiments argue against the possibility that compensatory changes in Vps34 expression partially rescue the Pi3K68D mutant phenotype (Figure 8—figure supplement 1). We also note another common signaling module that emerged from our genetic screen. Both CamKII and CamKK were identified as potential hits. The identification of CamKII is supported by prior work showing the expression of dominant negative CamKII transgenes disrupt the long-term maintenance of PHP in the GluRIIA mutant background (Haghighi et al., 2003). It has been assumed that postsynaptic calcium is used to detect the PhTX or GluRIIA-dependent perturbation. But, the logic remains unclear. PHP is induced by diminished GluR function and, therefore, diminished postsynaptic calcium influx (Newman et al., 2017). This should diminish activation of CamKII and yet, loss of CamKII blocks PHP. An interesting alternative model is that calcium and calmodulin-dependent kinase activity facilitate the function of the postsynaptic endosomal membrane system. Both calcium and calmodulin are necessary for endosomal membrane fusion (Colombo et al., 1997; Lawe et al., 2003). In this manner, the action of CamKK and CamKII would be entirely consistent with the identification of Class II/III PI3K and Rab11 as homeostatic plasticity genes. We have uncovered novel postsynaptic mechanisms that drive homeostatic plasticity. Eventually, continued progress in this direction may make it possible to not only reveal how stable neural function is achieved throughout life, but to uncover new rules that are essential for the processing of information throughout the nervous system. In particular, PHP has a very large dynamic range, whether one considers data from Drosophila or human NMJ or mammalian central synapses. The homeostatic control of presynaptic release can achieve a 7-fold change in synaptic gain, and yet retains the ability to offset even small changes in postsynaptic neurotransmitter receptor function (Cull-Candy et al., 1980; Müller et al., 2015). Thus, we expect that the regulatory systems that achieve PHP will be complex and have a profound impact on brain function. Here, we have defined a postsynaptic signaling system responsible for the rapid expression of PHP and propose a novel, albeit speculative, model for the postsynaptic control of PHP, taking into account the need for signaling specificity for the first time. Whether or not we are absolutely correct in proposing how these molecules function within a homeostatic signaling system, their identification paves the way for future advances in understanding how homeostatic signaling is designed and implemented at a cellular and molecular level. UAS-Pi3K68D-KD This paper Generated using site-directed mutagenesis with primers TTTGGAAACTTTAAGAGAGATC and CATGATGTTGTCATTGTGG then subsequently cloned into 1100 mCherry. All fly stocks were grown at 22–25°C on normal food, except when over-expressing UAS-Pi3K68D in the muscle with BG57-GAL4, which were grown at 18°C. Fly stocks used are: w1118 (wild-type), GluRIIAsp16 (Petersen et al., 1997), elavC155-GAL4, OK371-GAL4 (Mahr and Aberle, 2006), MHC-GAL4 (Petersen et al., 1997), BG57-GAL4 (Budnik et al., 1996), rim103 (Müller et al., 2012), dmpf07253 (Bloomington Stock Center 19062), Pi3K68D-RNAi (Exelixis Collection HMS01296 - Harvard Medical School), UAS-Pi3K68D:eGFP (gift from Amy Kiger), Vps34m22 (gift from Tom Neufeld), Pi3K68D-MB (Bloomington stock center #26363), Pi3K68D-GS (Kyoto Stock Center 203158), nos-GAL4VP14, UAS-cas9 (Port et al., 2014), PI3K Class I Pi3K92E RNAi (Bloomington Stock Center #27690), PI3K Class III RNAi (Vps34) (Bloomington Stock Center #33384), Pten-RNAi (Bloomington Stock Center 33643), UAS-GFP-myc-2XFYVE (Bloomington Stock Center 42712), UAS-Rab11 RNAi (Vienna Stock Center #22198), UAS-ManII-GFP and UAS-GalT-YFP (Ye et al., 2007), UAS-endostatin and UAS-endostatin-GFP (Meyer and Moussian, 2009). Using a genomic prep made from transgenic UAS-Pi3K68D flies (gift from Amy Kiger), we amplified the Pi3K68D cDNA and cloned it into pENTR/D-TOPO (Invitrogen, South San Francisco, CA). This was used as a template to generate UAS-Pi3K68D-∆N and UAS-Pi3K68D-KD∆21. Primers CACCATGAACGACACCGCCTCCGAC and GTTCCTGGACACCGCGCCC were used to amplify Pi3K68D-∆N. The PCR product was cloned into pENTR/D-TOPO (Invitrogen) and then cloned directly into the destination vector 1100 mCherry (gift from Dion Dickman). UAS-Pi3K68D-KD∆21 was generated using site-directed mutagenesis with primers TTTGGAAACTTTAAGAGAGATC and CATGATGTTGTCATTGTGG. This was subsequently cloned into 1100 mCherry. The Pi3K68D premature stop mutation was generated following the protocol of (Kondo and Ueda, 2013). Pi3K68D gRNA was selected using the CRISPR optimal target finder website (http://tools.flycrispr.molbio.wisc.edu/targetFinder). The gRNA sequence ACAGCACTCTGGTACTCGAG was cloned into the pCDF3-dU6:3gRNA vector (Addgene plasmid #49410, Simon Bullock). Flies expressing the UAS-gRNA were crossed with flies expressing UAS-Cas9 in the germline (nos-GAL4VP14, UAS-Cas9). Male offspring were used to create unique stable lines after removing the UAS-Cas9 and removing in the next generation the UAS-gRNA. Putative Pi3K68D mutants were sequenced to identify the nature of the Cas9 mediated mutation using the primers GTTTCCAAACATCTGAGCATCG and ATGACTTGCAGCAGGATCAG. Sharp-electrode recordings and two-electrode voltage clamp recordings were made from muscle six in abdominal segments 2 and 3 from third-instar larvae using an Axoclamp 900A amplifier (Molecular Devices), as described previously (Frank et al., 2006; Müller et al., 2012). Recordings were made in HL3 saline containing the following components: NaCl (70 mM), KCl (5 mM), MgCl2 (10 mM), NaHCO3 (10 mM), sucrose (115 mM), trehalose (5 mM), HEPES (5 mM), and CaCl2 (as indicated in figures). For acute pharmacological homeostatic challenge, unstretched larva were incubated in Philanthotoxin-433 (PhTX; 15 μM; Sigma-Aldrich) for 10 min. (Frank et al., 2006). Recordings were excluded if the resting membrane potential (RMP) was more depolarized than −60 mV, except for over-expression of UAS-PTEN and UAS-Pi3K68D which uniformly compromised RMP. A threshold 40% decrease in mEPSP amplitude, below average baseline, was used to confirm the activity of PhTX. For UAS-Rab11-RNAi expression a 15% decrease was used. EPSP traces were analyzed in IGOR Pro (Wave-Metrics) and with previously published routines in MATLAB (Mathworks) (Ford and Davis, 2014). mEPSP traces were analyzed using MiniAnalysis 6.0.0.7 (Synaptosoft), averaging at least 100 individual mEPSP events. EPSC amplitudes were analyzed in IGOR Pro (Wave-Metrics) with previously routines (Müller et al., 2015). Quantal content was calculated by dividing mean EPSP by mean mEPSP. The RRP was estimated by cumulative EPSC analysis, as described previously (Müller et al., 2012; Schneggenburger et al., 1999). In brief, muscles were clamped at −65 mV in two-electrode voltage clamp during a stimulus train (60 Hz, 30 stimuli). RRP for each muscle was calculated by dividing cumulative EPSC amplitude in TEVC by mEPSP amplitude in current clamp. Ptrain was calculated by dividing mean first EPSC amplitude by mean cumulative EPSC. Best-fit curves for mEPSP amplitude versus quantal content were fit in Prism 6 (GraphPad) using a power function for all wild-type data points ± PhTX. 95% data intervals were fit in IGOR Pro (Wave-Metrics) using a power function. Standard immunohistochemistry was performed as previously described (Pielage et al., 2005). In brief, filleted third instar larvae were fixed in either Bouin’s fixative (Sigma-Aldrich, 5 min) or 4% PFA (Affymetrix, 30 min), as indicated for each antibody below. Preps were washed in PBT (PBS with 0.1% Triton) for 1 hr, then incubated overnight at 4° in primary antibody in PBT. Larval fillets stained for the following primary antibodies were fixed with Bouin’s: mouse anti-BRP (1:100, Developmental Studies Hybridoma Bank, [Kittel et al., 2006]), rabbit anti-Discs large (Dlg, 1:1,000, [Budnik et al., 1996]), mouse anti-GFP (1:500, Invitrogen clone 3E6), mouse anti-GluRIIA (Developmental Studies Hybridoma Bank [Marrus et al., 2004]), rabbit anti-GluRIIB (1:2500, a gift from Aaron DiAntonio [Marrus et al., 2004]). Larval fillets stained for the following primary antibodies were fixed with PFA: rabbit anti-CLC (1:1000 [Heerssen et al., 2008]), mouse anti-CSP (1:250 [Zinsmaier et al., 1990]), rabbit anti-Syt1 1:1000 (a gift from Troy Littleton), guinea pig anti-Rab5 1:1000 (a gift from Tsubasa Tanaka), rabbit anti-Rab7 1:1000 (a gift from Tsubasa Tanaka), rabbit anti-Rab11 1:1000 (a gift from Tsubasa Tanaka). Preps were washed in PBT for 1 hr and incubated in secondary antibody in PBT for 1 hr at room temperature. Alexa-conjugated secondary antibodies were used at 1:500 and FITC-, Cy3- and Cy5-conjugated HRP was used at 1:100 (Jackson Immuno-research Laboratories). Preps were mounted in Vectashield (Vector). Immunolabeling of surface GFP was performed as described in (Wang et al., 2014) by incubating larval preparations in rabbit anti-GFP antibody (1:500) before permeabilization of cell membranes. Deconvolution wide field imaging for synapse morphology was performed using a 100x (1.4 NA) plan Apochromat objective (Carl Zeiss) on an Axiovert 200 inverted microscope (Carl Zeiss) equipped with a cooled CCD camera (CoolSNAP HQ; Roper Scientific). Image acquisition and analyses were performed in SlideBook software (Intelligent Imaging Innovation). Structured illumination fluorescence microscopy was performed using an N-SIM System (Nikon) with an Apo TIRF 100x/1.49 oil objective on a Ti-E microscope (Nikon) and an Andor DU897 camera. Z-stacks of 120 nm were collected for muscle 4 or 6/7. Images were reconstructed in NIS-Elements 4.12. Maximum projection images were made. Quantification of BRP and bouton number was performed as previously described (Wang et al., 2014). Boutons were counted manually on a Zeiss axioskop 40 compound microscope (40x, 1.1nA lens). Boutons of type 1b and 1 s were independently quantified for abdominal segments A2 and A3. Active zone number was calculated by counting individual BRP puncta (100x, 1.4nA lens) from maximum intensity projection deconvolved images, as previously described (Wang et al., 2014). Synaptic Clathrin Light Chain was quantified by masking for the neuronal membrane with HRP, then quantifying average fluorescence intensity using Slidebook Software in maximum projection images (Intelligent Imaging Innovation). Syt1 and CSP were quantified as previously described (Harris et al., 2015). FYVE-GFP, CLC, Rab7, Rab11, GalT-YFP, Pi3K68D-GFP, and FYVE-GFP puncta number and size were quantified with maximum projections from a fixed number of image planes. A region of interest in muscles 6, segments 2 and 3, was chosen not inclusive of muscle nuclei. Images were thresholded to the same value and puncta were analyzed with Fiji (Schindelin et al., 2012). The number of puncta was counted per ROI, and each puncta area was also measured. Rab5, Rab7, and Rab11 mean intensity per ROI were quantified by taking sum projections of the same number of slices of images (Fiji). Third instar w3605 larvae were prepared for electron microscopy as described in (Harris et al., 2015). For EM tomography, 200 nm sections cut with a Diatome diamond knife using a Leica UC-T ultramicrotome were picked up on Pioloform films with 2 nm C on Synaptek slot grids (Ted Pella, Inc). Sections were post-stained with 7.5% uranyl acetate followed by Sato’s lead sa (Sato, 1968). Dual-axis tilt series images (±60 deg) were acquired with an FEI T20 electron microscope at 200 kV equipped with a Tietz F816 digital camera. Tomograms were reconstructed using the eTomo package in IMOD (Mastronarde, 1997). The Journal of Cell Biology 204:1157–1172. Journal of Biological Chemistry 272:7707–7712. Journal of Biological Chemistry 275:11943–11950. Journal of Biological Chemistry 286:4216–4225. Journal of Biological Chemistry 282:28226–28236. Journal of Biological Chemistry 280:40766–40772. Current Opinion in Neurobiology 39:8–16. Current Opinion in Cell Biology 35:137–143. The Journal of Cell Biology 181:655–666. Philosophical Transactions of the Royal Society B: Biological Sciences 372:20160158. Current Opinion in Neurobiology 22:405–411. Molecular Biology of the Cell 14:2935–2945. Molecular and Cellular Biology 24:796–808. Current Opinion in Neurobiology 19:168–173. Journal of Structural Biology 120:343–352. Molecular Biology of the Cell 16:4841–4851. Development, Growth & Differentiation 51:483–498. The Journal of Cell Biology 150:F57–F62. Biochimica Et Biophysica Acta (BBA) - Molecular and Cell Biology of Lipids 1851:794–804. The Journal of Cell Biology 193:201–217. Current Opinion in Microbiology 13:677–683. Annual Review of Genetics 38:725–748. Nature Reviews Molecular Cell Biology 13:195–203. The Journal of Cell Biology 190:407–425. Current Opinion in Cell Biology 39:53–60. Frontiers in Synaptic Neuroscience 2:1–16. Journal of Cellular Physiology 206:586–593. Thank you for submitting your article "A postsynaptic Pi3K-CII dependent signaling controller for presynaptic homeostatic plasticity" for consideration by eLife. Your article has been reviewed by three peer reviewers, and the evaluation has been overseen by Kang Shen as the Reviewing Editor and Eve Marder as the Senior Editor. The following individual involved in review of your submission has agreed to reveal his identity: Joshua M Kaplan (Reviewer #1). All three reviewers recognized that this paper is the first comprehensive characterization of the postsynaptic mechanisms of PHP and found it appropriate for publication in eLife. They did raise a number of questions which I will list below. Through discussion with each other, we have come to the conclusion that you can address the issues by revising the text and including new discussions. If you have additional data that speak to some of the questions such as mutant allele analysis of vps34 or rab11, you are also welcome to add them. In particular, the reviewers would like to see some discussions about the steady state GluR levels in the endocytic mutants and how that could potentially affect PHP. We expect a quick turn around after you resubmit your manuscript since the reviewers did not demand specific experiments to be added. We look forward to receiving a revised version of this manuscript. The manuscript by Hauswrith et al. describes the results of an RNAi screen of the Drosophila kinase and phosphatase proteome to identify components of homeostatic plasticity at the fly NMJ. The authors identified several hits in the late endosomal pathway, and focus on the characterization of one of those hits in detail – PI3K-c11. The authors provide compelling evidence that a postsynaptic late endosomal pathway is essential for homeostatic plasticity, and show that PI3K-c11 mutants disrupt the formation of this compartment. They find an interesting effect on extracellular calcium levels as a regulator of the mechanism, indicating that the pathway is required to support homeostatic at low calcium levels, but not high. They provide some interesting speculation on how this might arise, but sorting it out will require more experimentation. Overall, it's a nice study with some compelling data. I especially liked the individual recordings shown in Figures 1 and 2 that really highlight how robust this form of plasticity is. The characterization of the PI3K-c11 mutant is robust and provides a strong argument for this pathway regulating late endosomal compartments and the homeostatic response to both acute and long-term blockage of postsynaptic glutamate receptors. Please discuss if the steady state GluR levels is affected the endocytic mutants and how that could potentially affect PHP. 1) In Figure 2D, the QC scatter plot for Pi3K68D mutants seem substantially shifted to lower values than the predicted curve for WT controls. Does this suggest that QC is reduced at baseline in these mutants? 2) The conclusions concerning Rab11 and VPS34 would be strengthened if analysis of mutant alleles (or mosaic animals) were provided. I agree that the strength of the Pi3K86D data offset this concern somewhat; however, analysis of mutant alleles would strengthen the authors' conclusions. Perhaps you already have such data? 3) Could the authors speculate about the identity of the EE/RE cargo that requires Pi3K68D? 4) Do the endosomal mutations and RNAi alter RE/EE cargo flux? This could be measured with a fluorescent tracer (e.g. Transferrin). 5) Wouldn't you expect changes in GluR abundance if RE trafficking is perturbed? The data shown in Figure 4B suggest that mEPSP amplitudes are decreased with Pi3K68D over-expression. Was the GluR staining also decreased in these animals? 6) What is the Muscle O/E genotype shown in Figure 4B? I thought that this UAS was lethal when expressed by the BG57 GAL4 driver. 7) The Discussion has an elaborate section involving speculation about PHD. Does Pi3K86D regulate PHD? If not, this aspect of the discussion seems weakly connected to the main findings reported here and should be minimized. 8) Is it fair to normalize EPSCs to mEPSPs for QC calculations? 9) The authors should discuss/speculate about why PHP in Pi3K mutants is sensitive to external calcium levels? Is PHP sensitive to EGTA-AM? 10) Does Pi3K68D mutation alter RMP? (over-expressing Tgene does, subsection “Pi3K68D is required postsynaptically for PHP”, first paragraph). 11) Is FYVE-GFP or Rab11 staining altered when PHP is induced? This would suggest that post-synaptic Endosomes signaling are involved in PHP induction. 12) At several points in the text, you refer to a post-synaptic endosomal "platform" for PHP (e.g. when discussing the model in Figure 9). Please explain what you mean by this term. 13) Pi3K68D-MB is apparently the Minos insertion MB08286 (Materials and methods). I am surprised this has a mutant phenotype, as the splice trap in the Minos is in the wrong orientation for Pi3K68D. This mutation would be more likely to block expression of CG14131, a gene within the Pi3K68D intron that goes in the opposite direction. The MB is in its intron. They should look at the MiMIC insertion nearby (MI15179, also available from Bloomington), as that is in the right orientation to trap splicing of Pi3K68D. Of course, their CRISPR allele appears to show that the phenotype can be produced by only perturbing expression of Pi3I68D, so this should not call any of their results into question. However, the MiMIC allele would be useful for another experiment they should do (although not necessarily for this paper), which I will describe below. 14) I question their interpretation of the deltaN overexpression phenotype (subsection “Pi3K68D is required postsynaptically for PHP”, last paragraph). If the N terminus interacts with clathrin, and they overexpress a mutant lacking this region in a wt background, this protein (if it is active) should still have activity but be incorrectly localized. In their model, it should not interfere with binding of the wt protein (which is still expressed) to clathrin, since deltaN lacks the clathrin binding site. If clathrin does indeed bind to the N terminus, and they wish to test whether this is important, they would need to instead ectopically express only the N-terminal region, without the kinase. This should then act as a dominant negative, occupying all the sites on clathrin and thus preventing correct localization of the wt protein. Actually, the fact that overexpression of the kinase-dead mutant blocks PHP already makes this point (second paragraph of aforementioned subsection), although not as cleanly as expression of only the N terminus would. The KD mutant should act as a DN, unlike the deltaN mutant, because it would bind to clathrin, occupying the binding sites for the wt kinase, but would not itself have kinase activity. 15) In this regard, it is interesting that there are two forms of the Pi3K68D mRNA (RE and RB) that would encode truncated proteins (PE and PB) encoding only the N terminus. Perhaps these are natural regulators of the kinase whose expression determines whether or not the kinase can find a clathrin binding site? It would be interesting to see where these isoforms are expressed, and to express RE or RB cDNAs and see if they act as DNs. 16) I don't understand the section on the effects of changing Ca concentration. The results are intriguing but seem difficult to interpret in any mechanistic way given the information that exists at present. The Discussion is very hard to read. Perhaps this is inevitable given the confusing nature of the results. 17) Related to point 16), they seem to be saying that since PHP works normally in the mutant at physiological (1.5 uM) Ca++ concentrations (subsection “Loss of Pi3K68D renders the expression of PHP sensitive to changes in extracellular calcium”, second paragraph), these mutants must have been normal with respect to this phenomenon during their development in vivo. It is only when they are filleted and incubated at low Ca++ that a phenotype is observed. It would be very informative about what is going on if they could determine whether the development of the larva in the absence of Pi3K68D renders fillets from these animals abnormal with regard to PHP at low Ca++, or if the activity of Pi3K68D during the experiment is required for normal PHP at low Ca++. It seems like this should be addressable in their system, because there are many Pi3K inhibitors that have been described. They could fillet wt embryos, or embryos lacking one copy of the gene, and then incubate them with the inhibitors and see if this affects PHP. But, perhaps the available inhibitors are not specific enough for this form of Pi3K, or perhaps they don't work in Drosophila? It seems like the investigators probably know the answer to this question already, since it is an obvious experiment. If so, they should inform us in the paper. If not, they should do the experiment. 18) If inhibitors don't work or are not specific enough, there is another approach that could address this question. This experiment would require more time than is normally given for revisions, and the paper is already strong, so I would not require it for publication. The Bellen lab (Nagarkar-Jaiswal et al. eLife 2015) has shown that the DeGradGFP method can transiently inhibit gene function by degrading a GFP fusion of the protein. There is a MiMIC in an appropriate position to allow replacement of the MiMIC by GFP using their methods, to create a "protein trap". In the Bellen paper, they show that such protein traps often retain function. Thus, if they were to make a protein trap and found that this allele behaved like the wt protein, they could then turn off Pi3K68D activity using the temperature-sensitive DeGradGFP mechanism in larvae that had developed with normal activity. In the Bellen paper, they show that they can rapidly shut off Dunce and turn it back on by temperature shifts. 19) From the images, it’s clear there are robust changes in postsynaptic endosomal compartments. However, it is less clear if there is any change going on presynaptically. Clearly they demonstrate the effect on homeostatic plasticity is postsynaptic, but it would be interesting to know if the same changes in subcellular markers is occurring in the presynaptic bouton. I assume PI(3)P would be required in both compartments to properly generate that endosomal compartment – if not it would be interesting, but very surprising. I assume the authors already have that data from their images, so would be nice to comment on it in the text. 20) The authors nicely show postsynaptic rescue of the Pi3K mutant phenotype. However, it wasn't clear why they didn't also show postsynaptic RNAi knockdown blocks PHP. Did I miss that somewhere – if not, why not show that as well to complement the rescue? 21) The last minor comment deals with the Pi3K68D structure function part. They infer the clathrin binding domain and kinase activity are important by overexpressing constructs missing these elements and observing a block in PHP. I would have preferred to see this being done as a rescue of the null mutant – seems a far easier result to interpret. Why was the overexpression used instead of rescue? 22) Not sure how the EM was quantified, or if it was. In principle, we agree. But, there are several reasons why we have restricted our analyses to UAS-RNAi. First, Vps34 null mutations are not viable to the 3rd instar stage and mosaic analysis in poly-nucleated muscle is problematic. Second, we needed to specifically test the function of Rab11 and Vps34 in muscle, without altering important neuronal function of these molecules. Tissue-specific RNAi is the method of choice. Finally, in our original submission, we did go so far as to remove one copy of Vps34 in the Pi3K68D homozygous background and found no additive effect (Figure 8—figure supplement 1). Second, we now provide new data that the EE/RE cargo is unlikely to be Multiplexin, a matrix protein, required for PHP (Wang et al., 2015), that can be cleaved to release Endostatin. In new supplemental information we demonstrate that muscle-specific expression of UAS-Endostatin is secreted from the muscle in the Pi3K68D mutant, and this condition fails to rescue homeostasis in the Pi3K68D mutant (Figure 5—figure supplement 1). These data argue that the block of PHP in the Pi3K68D mutant cannot due to a failure to secrete Endostatin from muscle. We agree this is an interesting question and something to test in the future. It seems likely that the flux of a fluorescent tracer would be altered, but creating a link to the mechanisms of PHP will be a challenge best addressed in a new study. The reviewer is correct. Muscle expression using the BG57-GAL4 driver is lethal, as we originally stated. However, for this experiment, we used the MHC-GAL4 reagent to drive UAS-Pi3K68D-GFP (see Supplementary file 1 for full genotypes). This animal is viable. The MHC-GAL4 driver initiates expression post-embryonically, whereas BG57-GAL4 initiates expression during embryonic development of the musculature. This may account for why MHC-GAL4 can be used for this experiment. We have amended the text to highlight the use of MHC-GAL4 and thank this reviewer for pointing out this omission. We have taken the comments of the reviewers to heart and shortened this section of the Discussion. The ideas in this part of the Discussion are pure speculation. But, as a model, we felt it was valuable to incorporate since it might spur other laboratories to consider these possibilities. We were (and still are) careful to state that this is a speculative model. This is simply a means to illustrate the effect of diminished mEPSP amplitude caused by application of PhTX, a technique that we have used in the past. The raw values underlying all of our measurements are presented in the supplementary file so that it is clear how the calculations are made and what the underlying measurements reveal. We devoted a significant portion of our original Discussion section to this topic. Indeed, the second paragraph of the Discussion begins, “Any model to explain the role of PI3K-cII and Rab11-dependent endosomal signaling during homeostatic plasticity must account for the phenotypic observation that PHP is only blocked at low extracellular calcium concentrations.” Following was a rather lengthy discussion of the data and results and speculation. As requested, we have condensed the speculative portion of the text. The Pi3K68D mutation does not impair RMP. For the data plotted in Figure 2, there is a small but significant increase in RMP in Pi3K68D: WT -64.5 ± 0.45 mV and Pi3K68D -66.4 ± 0.55 mV, p=0.015. It seems unlikely that flux through the endosomal system could be resolved by changes in the steady state levels of these proteins. With this said, future studies to identify potential cargo and flux of this cargo through the endosomal system will be a focus. A platform can be defined as a surface that is used to support a structure or device. It can also be defined as a vehicle that is used to deliver a cargo or device (definitions are paraphrased from the Merriam Webster dictionary). This term seemed to be a reasonable, generalized way to refer to the function of the postsynaptic endosomal signaling system during homeostatic plasticity. In general, the presence of a large transposon insertion within a gene locus can function as a gene mutation. There are many reasons why this is the case, irrespective of whether the transposon functions as a gene-trap. We refer the reviewer to an earlier gene trap paper that we published in which we manipulate the size of the transposon insertion and demonstrate that the size of the transposon affects mutagenicity (Clyne et al., 2003; Genetics). As the reviewer points out, this is just one part of our genetic argument, which includes a newly generated CRISPR mutation, a second transposon insertion allele, tissue-specific RNAi and use of both a kinase-dead, dominant negative transgene as well as an N-terminal truncation. This would, indeed, be worth examining in the future. The calcium-dependence of PHP in the Pi3K68D mutant is surprising. As stated above, we devote a considerable portion of our Discussion section to this issue. We start the second paragraph of the Discussion as follows: “Any model to explain the role of PI3K-cII and Rab11-dependent endosomal signaling during homeostatic plasticity must account for the phenotypic observation that PHP is only blocked at low extracellular calcium concentrations.” As requested, we attempted to improve the clarity of our Discussion section, and we have shortened this section according to the request of one of the reviewers. This is an issue that we have made many attempts to address. Unfortunately, existing pharmacology is not applicable to Drosophila (and we have consulted closely with the laboratory of Dr. Kevan Shokat, a world expert on kinase signaling). Currently, there are no commercially available, specific class II PI3K inhibitors. Neither wortmannin nor LY294002 inhibit Drosophila class II PI3K. Thus, we moved on and attempted to inhibit Vps34 (Bago et al., 2014; Ronan et al., 2014). Vps34 inhibitors can cause a decrease in FYVE-GFP levels in mammalian cells in culture. Based on this assay, in Drosophila muscle, these inhibitors have no effect. These experiments included multiple concentrations of the inhibitor and tests using multiple incubation times. These reagents also do not alter PHP. Finally, it is worth noting that the active site of Vps34, comparing fly and mammals, is not very well conserved, providing and explanation for why the inhibitors are ineffective in Drosophila (Ronan et al., 2014). We agree that this method could be used to acutely inhibit gene function of Pi3K68D and that it would be a worthwhile future experiment. We have had mixed results using this approach with other signaling systems, but it seems superior to methods of protein destruction based on oxygen radical generating reagents such as Mini-SOG and FlAsH-FALI. We did quantify staining intensity using a region of interest delineated by presynaptic markers. However, upon consideration of these data, we decided against inclusion in our manuscript because it is impossible to distinguish between pre- and post-synaptic labeling as they are superimposed. Thus, it is not possible to draw any conclusions regarding pre- versus postsynaptic labeling. Ultimately, as in prior papers, it would be necessary to devise a way to exclusively isolate presynaptic endogenous expression, which is both non-trivial and not the focus our study. We identified Pi3K68D based on tissue specific RNAi in our genetic screen. We used additional reagents to confirm and extend this initial finding. The rescue experiment also would have a confound in that the presynaptic neuron would lack Pi3K68D. The fact that there is dominant interference, with otherwise normal Pi3K68D expressed presynaptically, underscores the postsynaptic function of Pi3K68D. The EM figure reports an observation based on EM-tomography. It is not quantified. We thank Özgür Genç and Brian Orr for critical reading of the manuscript, and Amy Kiger and Flora Rutaganira (Kevan Shokat Lab) for collegial support throughout. Supported by NIH Grant R35NS097212 to GWD and 5T32GM007618 and F30NS092211 to AGH. We acknowledge support of the Nikon Imaging Center at UCSF and the Kavli Institute for Fundamental Neuroscience at UCSF. © 2018, Hauswirth et al.